Eager to play Bioshock Infinite, I reloaded Bioshock 2 on my PC to tide me over until its 2012 release. When setting up my video options to the max, I noticed that “Force Global Lighting” was off, while all the other options were on. I decided to make sure everyone knows the difference because it sounds confusing with no context. What does Force Global Lighting mean? The term Global Lighting actually sounds important, as if turning it off would somehow disable the lighting effects “globally” or “for the entire game.” In this context, however, this is not what it means. 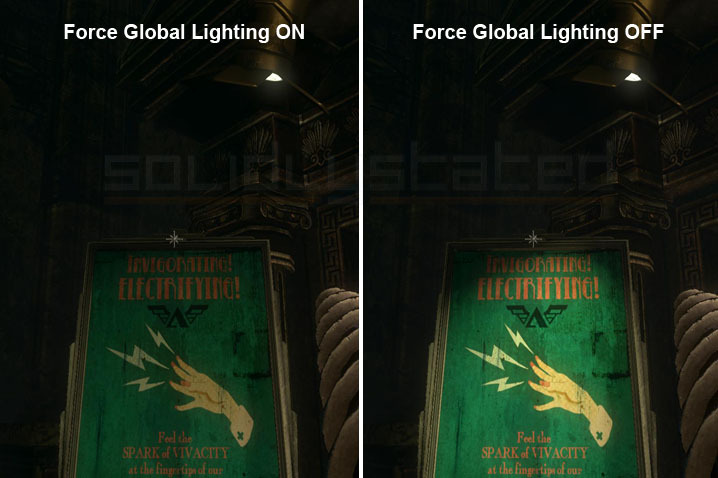 The force global lighting option refers to casting all the game’s light from a single light source. Today’s games have many light sources at any given times, whether it is from various lamps, open flames, or electric displays. These multiple light sources all give off a color and cast shadows that the graphics card needs to process. 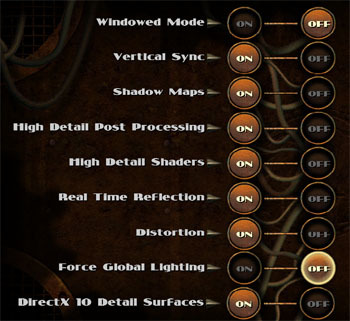 The option to “Force Global Lighting” is designed to get rid of all the various light sources and decrease the load on your PC. As you might guess, anything that makes your game faster also makes it less attractive. Do I want global lighting on or off? Leave the option OFF if you want the best graphic image quality. See the comparison image down below to see the how multiple light sources enhance the graphic experience. Turn the option ON if the frame rate of the game is too low to enjoy it. This option will not make much of a difference compared to other options, but will slightly improve your performance nevertheless.